Alright, time for a break from all the Apple news, Nokia recently announced that the Lumia 920 and Lumia 820 will be arriving on 21 December 2012. If you wish to land your hands on one without having to queue up, DiGi’s preorder is now out, allowing you to pay and secure a unit and have it delivered to your doorstep. 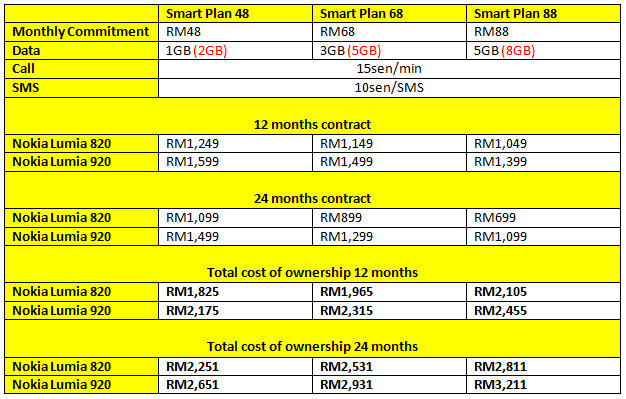 Just a friendly reminder, from now until 3 February 2013, DiGi is offering up to double the internet with its phone bundle so if you sign up for a bundle for the Lumia 920 and Lumia 820 with DiGi, you’ll get up to twice as much internet for the same price; the total data is highlighted in red. Nokia Lumia vs iPhone 5, what’s your pick? More information about these new Lumia additions, check out our previous posts. Screenshots available after the break or visit DiGi for more information about Nokia Lumia 920 and Lumia 820.